'Food, glorious food . . . magical food, fabulous food, beautiful food." Those lyrics from "Oliver!" apply to many of the works on view in "Art and Appetite: American Painting, Culture and Cuisine" at the Art Institute of Chicago. 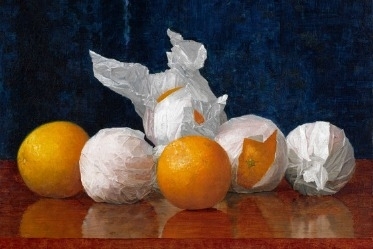 There's the gorgeous near-neon glow of William J. McCloskey's "Wrapped Oranges" (1889), each emerging from crinkled white paper in hyperrealist rendition; the overabundance of Severin Roesen's "Still Life With Fruit" (c. 1860), which culminates in an elegant glass of white wine; the fluffy, freshly caught rabbit in William Michael Harnett's "Trophy of the Hunt" (1885); the marbled beef in Roy Lichtenstein's "Standing Rib (Meat)" (1962); and the congenial sandwich and beer in Tom Wesselmann's "Still Life #4" (1962). They make you want to reach out and dig in. But while lovely to look at, they and the other paintings in "Art and Appetite" have deeper significance. Judith A. Barter, the exhibition's curator, argues that American artists used their depictions of food to comment on socioeconomic, artistic and political issues of the day. These paintings can—and should—be read for their hidden meanings, just as classic Dutch still lifes always have been. Organized around a dozen themes—such as "World Markets," "Trompe l'Oeil Painting and Politics" and "Modernity and Cocktail Culture"—the exhibition stretches a little thin in a few places; sometimes a peach is just a peach. But it generally makes its case. And it has another laudable dimension: While many big names are present (John Singer Sargent, Edward Hopper and Wayne Thiebaud, to name a few), this exhibition celebrates some lesser-known artists, like McCloskey, Elizabeth Paxton, Helen Searle, Hannah Brown Skeele and Joseph Decker. "Art and Appetite" starts out with that quintessentially American display of food, Norman Rockwell's "Freedom From Want" (1943), which is usually interpreted as a nostalgic Thanksgiving picture, a happy home in the land of plenty. Here, shown near Lichtenstein's tightly focused "Turkey" (1961) and Alice Neel's gangly uncooked bird in "Thanksgiving" (1965), Rockwell's wartime painting delivers a more complex message. Where are the potatoes? The vegetables aside from celery stalks? Is dessert fresh fruit, not pie, because sugar was rationed? By holiday standards, the food is actually spare. Then the exhibition reverts to a loosely chronological path through its themes, starting with a roomful of bountiful, early 19th-century still lifes that trumpet the richness of North America. The best, a sumptuous, late-summer array called "Still Life: Balsam Apple and Vegetables" (c.1820s) by James Peale, nevertheless signals a certain wariness with the presence of a long, skinny "apple." In reality, the apple is a poisonous pear that likely refers to the contemporaneous debate about overfarming and soil erosion. As the early Republic grew, so did its place in world trade. Affluent Americans bought imported wines and fruits, which naturally began showing up in art. The rich would signal their status by purchasing works like Charles Bird King's "Still Life on a Green Table Cloth" (c.1815), which displays a whole pineapple, a symbol of hospitality, and glass decanter. Dessert paintings like King's, which were common in the first quarter of the 19th century, also gave a nod to our prominent sweet tooth, even then. Or was it a warning? That idea surfaces later in the show in the gallery called "Modest Meals in the Gilded Age," with Decker's "Upset" (c.1887). This overturned box of candies, perhaps a cautionary comment on the results of overindulgence or on the mass-produced foods that had grown all too common in the American diet, was blasted by critics as an unworthy subject for "the poet of green apples and greener pears." 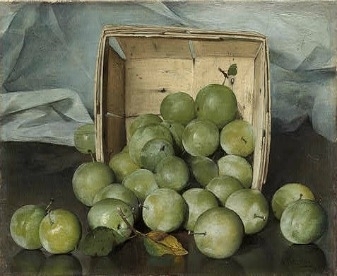 Not true, but Decker's lovely "Green Plums" (c.1885), spilling out of a crate, is here in case you need proof of his abilities. The section on "Picnics, Parties and Feasts" introduces another rarely shown artist, Robert Spear Dunning, whose "Harvest of Cherries" (1866) is a textured, meticulously painted still life turned narrative painting. It focuses in on a basket overflowing with cherries, plus a woman's blue-ribboned bonnet and man's straw hat, also filled with cherries, which often symbolize love, fertility and merriment. It's easy to imagine the romantic frolic taking place just beyond the picture frame. Though small, "Harvest of Cherries" even manages to steal attention from the nearby bigger and beautifully painted "A Pic-Nic Party" (1846) by Thomas Cole, the father of the Hudson River School. This mix of familiar and unfamiliar artists succeeds in gallery after gallery. Three of Harnett's well-known tromp l'oeil works, for example, are shown with two by De Scott Evans: "The Irish Question" (1880s), two raw potatoes hanging from a string, which refers to the potato famine, immigration and Irish independence; and "Free Sample, Take One" (c.1890), a shadow box with a dozen peanuts behind a jagged pane of glass. Its coded message might be about racial and labor anxieties—peanuts were associated with African-Americans and "free" is probably used ironically, alluding to the harm that might result from reaching through that shattered pane. When the exhibition segues into the 20th century, it presents works to illustrate the rise of dining out and "the cocktail culture." These sections have many winning works, not least Hopper's "Nighthawks" (1942) and Marsden Hartley's small but deeply felt "Banquet in Silence" (1935-36), which deploys the Christian iconography of fish to mourn the drowning of three fishermen. And then the show does something a bit unusual: It keeps going. American art exhibitions often stop somewhere in the first half of the 20th century, when museums start calling the art "modern" and "contemporary." The timeframe for "Art and Appetite" runs from revolutionary days to the mid-1960s, and Ms. Barter said she would have gone further if there'd been room. But this is a large show: 72 paintings and sculptures, plus 22 decorative art items and 23 vintage menus, cookbooks and bits of ephemera. So it ends with the likes of Andy Warhol, Claes Oldenburg, Thiebaud and Wesselmann—with, respectively, their soup cans, fried eggs, ready-made desserts and Four Roses whiskey. The last, as Ms. Barter put it in the catalog, "the literal dilution of American values and traditions." But let's not end on a low note. "Art and Appetite" also comes with an entertaining exhibition catalog. It tells of breakfast in the 1830s, consisting of "chops, meats, fowl, ﬁsh, and potatoes," and how "the earliest-known 'instant' traveling food"—portable soup cakes—"was concocted around 1763 by a Maine doctor's wife" for her husband on calls. It tells of hotels in the 1840s that held separate seatings for women travelers and for men. It provides recipes for New Orleans gumbo (1847), "macaroni pudding" (1838) and tomato soup cake (1950), among many others. It concludes with a nod to chef Alice Waters, whose stress on locally grown ingredients gets us past Pop and takes us full circle, back to those early American still lifes.